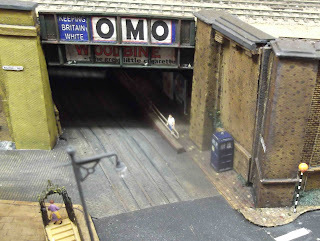 It was announced that the long-running battle of the apostrophe had been resolved - at Warley, where the "pro" camp acquired a new nameboard for the layout including the apostrophe, whilst the attention of the "anti" camp was otherwise engaged. 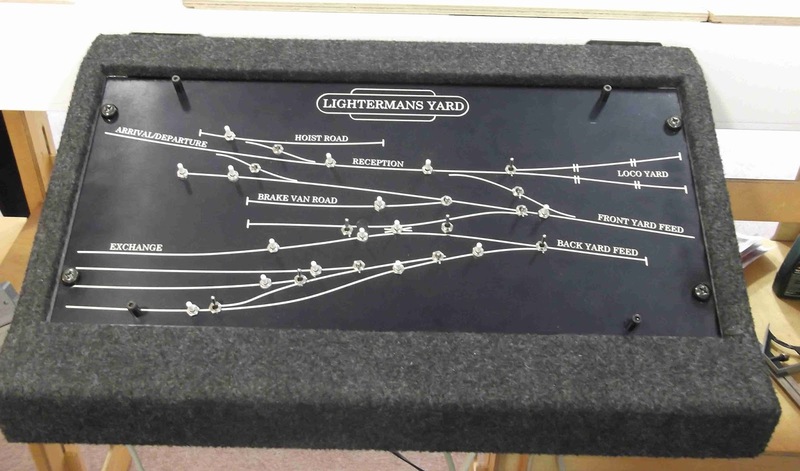 So the layout is officially "Lighterman's Yard" (until the "anti" camp find a suitable response). Apart from consumption of suitable festive refreshments, kindly provided by Pete Townsend, most of the meeting was spent discussing the backscene. 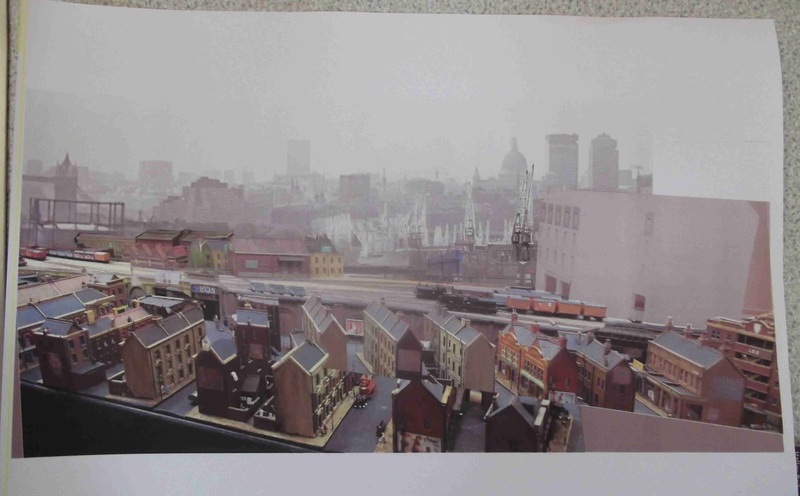 Richard brought two mockups, combining photos of the layout with a silhouette-style backscene - one in colour and one in black and white. 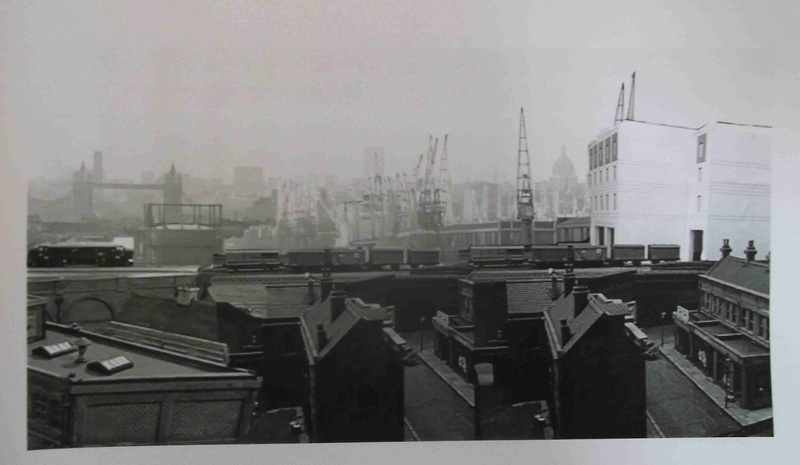 These met with universal approval, though it wasn't clear which of the skyscrapers will need to be removed for the 1960s. There was much discussion of the right viewing angle, and the consequent adjustments needed (depth of viewing window, depth of backscene), but until heights of operators and spectators are standardised it will be difficult to satisfy all involved. Provisional suggestion is that the top of the viewing window needs to be lowered by 4.5 inches, and the backscene needs to be about 15 inches high. 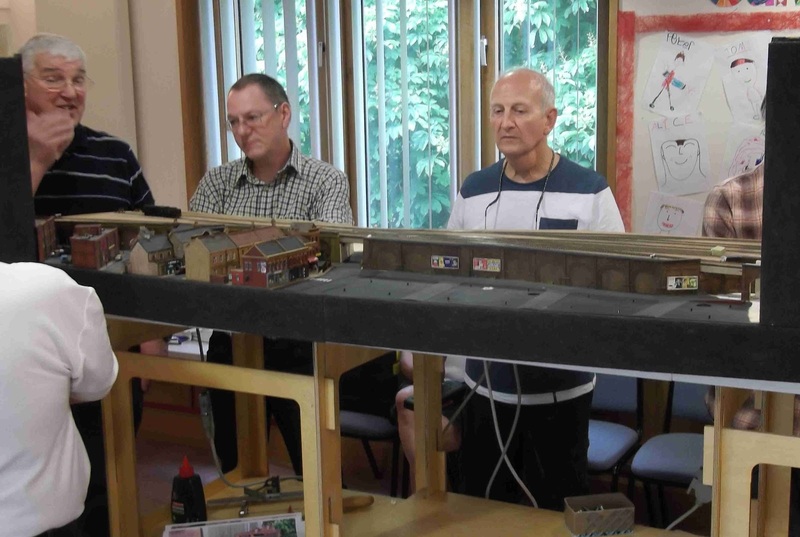 All the regular members turned up for the meeting, including two who had missed the Exhibition (with feeble excuses about holidays), as well as three visitors. 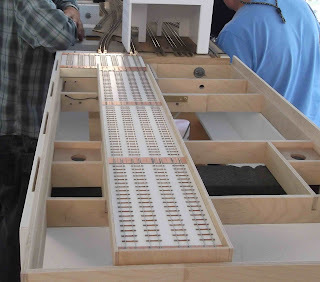 The main running boards were assembled for a troubleshooting session, tracing the cause of a dead section that had appeared towards the rear of the layout on the final afternoon of the Exhibition. Poor contact with part of a point frog was the diagnosis, and was fixed. We were assured by David Smith that real railwaymen (i.e. drivers) never used the term turnout, always point - though lesser mortals like civil engineers sometimes got it wrong. So we will try to get it right in future. The fixed area was successfully tested, with the Jinties that did the shunting for the Exhibition. 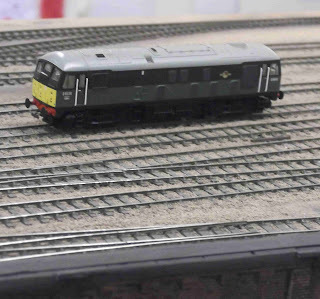 Also Keith's converted Dapol Western diesel tested the track, suggesting a little more work might be needed, though on the loco rather than the track. 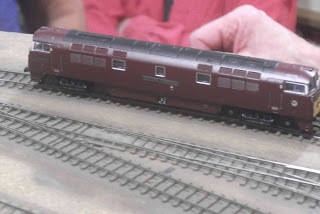 One bogie used home converted 2FS tender wheels, and worked well, the other used the original Dapol wheels with adjusted back-to-backs, but it appeared the flanges were still a little too coarse. 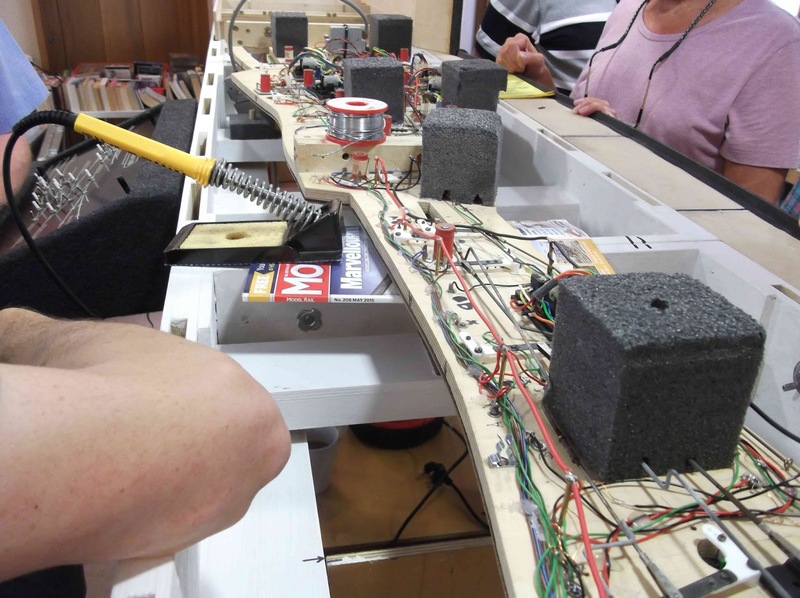 The rest of the layout was tested, showing no further problems, then it was dismantled and put away to avoid distracting the group during the debriefing session. 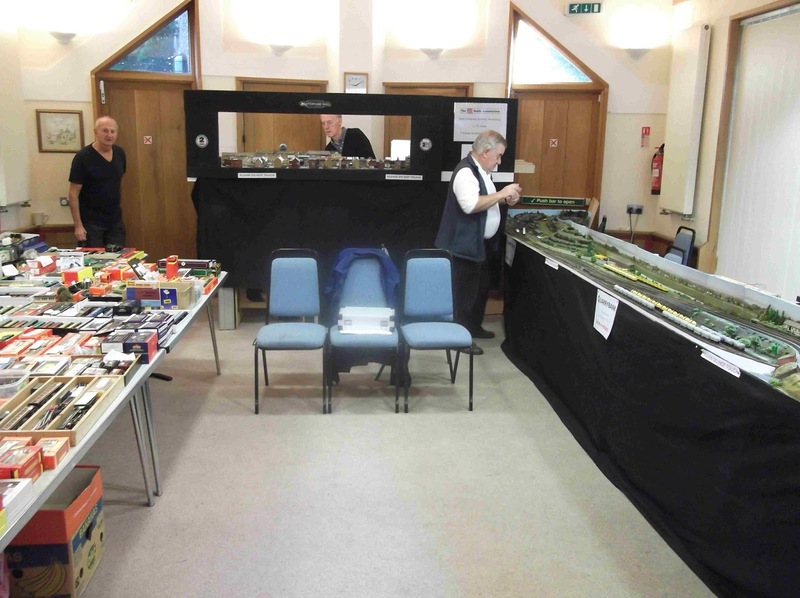 I think the main conclusion was that there had been too little operator experience on the layout (the planned pre-Exhibition operating session having morphed into a bug-finding session). So more intensive operator training (aka "playing with trains") is planned before the next Exhibition. Incompatibility of coupling heights was discussed - Alan Smith, having rather less vehicles, agreed to adjust his to match Keith's. Invitations to Chatham Exhibition (June 2016) and Bournmoor and Farnham (2017, both 2FS-related) were accepted. Pete Townsend brought along a newly-acquired Farish Merchant Navy, converted using Association wheels, Jinty conversion kit for the loco and frame bushes for the tender. Wheel-quartering seemed slightly off, otherwise it ran well on Alan Smith's test and demo track. 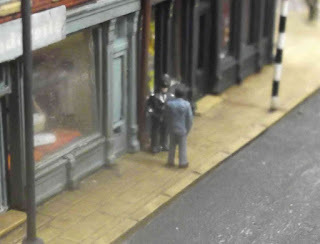 As it hasn't yet been converted to DCC it couldn't have a run on Lightermans Yard as this month's implausible visitor. 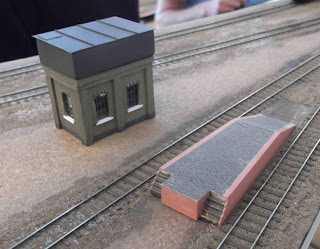 Alan Smith brought along the latest iteration of the goods shed/warehouse, with suggested windows and brickwork, together with pictures of a selection of real-world prototypes for comparison. 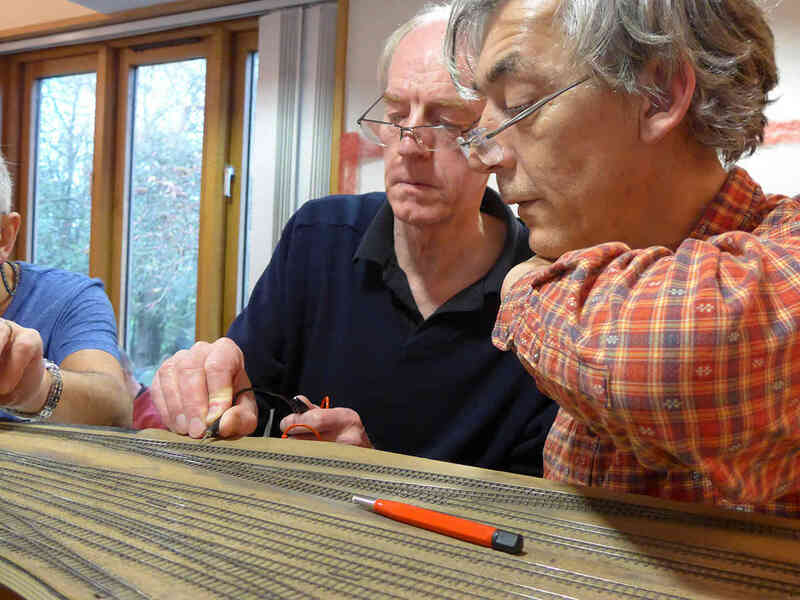 Richard was conscripted to work on a backscene - having suggested digital printing on vinyl-like material. Keith volunteered to set up a list of "things to do" to try to ensure the most important improvements were finished and installed and tested in time for the next outing to Chatham in June 2016. Peter Townsend distributed some model cars, expecting them back assembled, painted, glazed and weathered for installation on the layout. 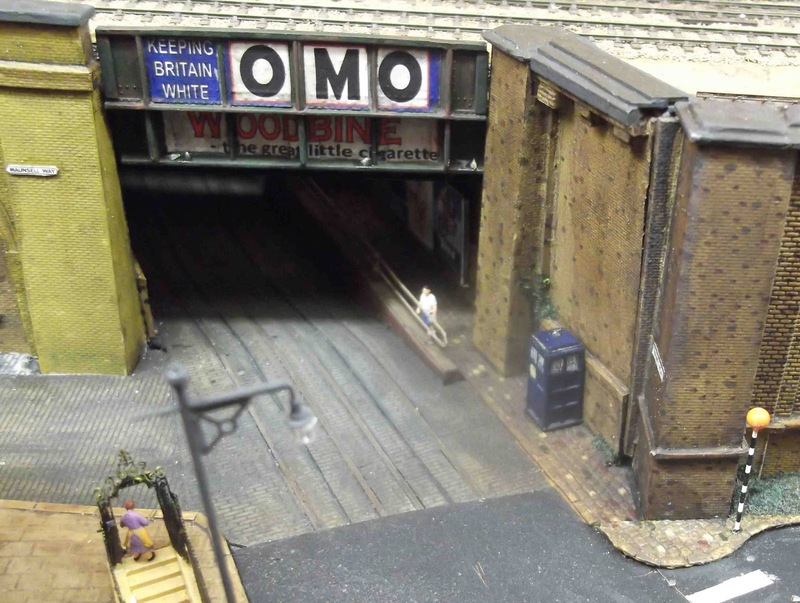 He also revealed that he had demolished one of the two recently built blocks of flats, replacing it with a viaduct to produce a better scenic break in front of the fiddle yard. 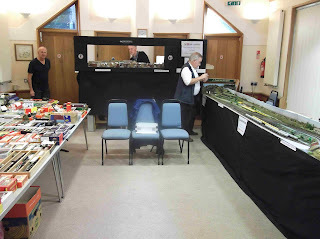 Six of us arrived bright and early on Saturday morning to set up the layout - to find that the other two stands in the room hadn't left enough space. 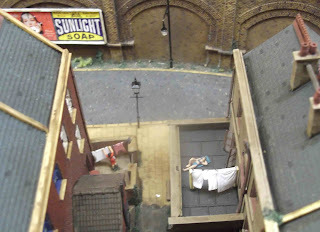 After some delicate negotiations, one of the stands was moved far enough to allow us to squeeze Lightermans Yard into place. 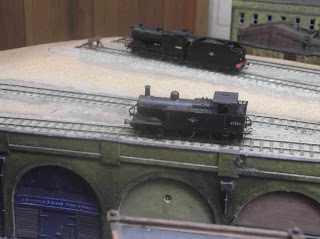 Alan Smith and Keith provided rolling stock - a couple of Jinties for shunting, and a variety of locos to transfer wagons between layout and fiddle yard. The first day saw rather too much rolling stock in use - at times it was difficult to find a spare siding into which to shunt the latest arrivals. Running was generally very good, apart from the occasional operator error (usually driving into wrongly set turnouts). 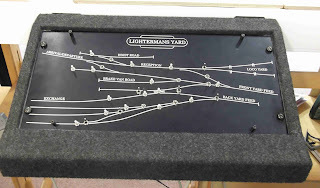 There were a few serious electrical problems with the layout, but we became fairly proficient at tracking these down and either fixing them or finding workarounds. Coupling and uncoupling wasn't as reliable as we would have wished - I think the two contributors of rolling stock used slightly different height standards, and operators often found it difficult to locate the uncouplers on the layout. Comparison of slow-running of the two Jinties suggested the greater cost of CT decoder chip against Bachmann chip was justified. 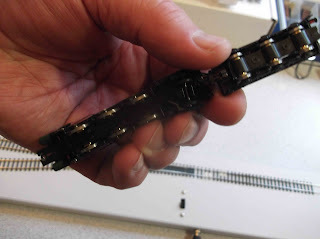 The second DCC controller showed a frequent tendency to misbehave, but this usually seemed to be the after-effect of shorts on the layout, and it recovered eventually. 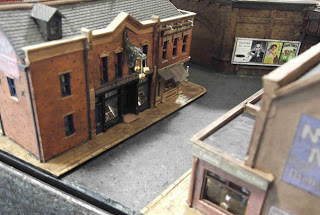 Spectators were highly complimentary about the layout, particularly the buildings. Children were generally challenged to "Find the pigeons", and rarely succeeded. A small colony of 3-d printed pigeons has started to inhabit the area around one of the bridges, and is expected to spread further (particularly to the carpet). 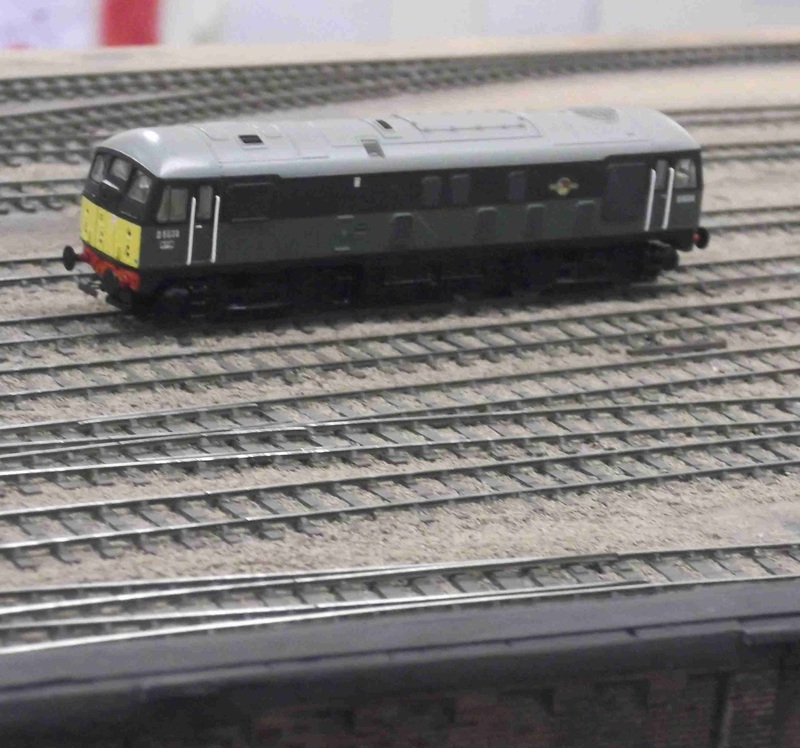 One unhappy young spectator hurled his dummy at the layout, scoring a direct hit to derail one of the Jinties from a distance of about six feet. Perhaps a future English cricketer? 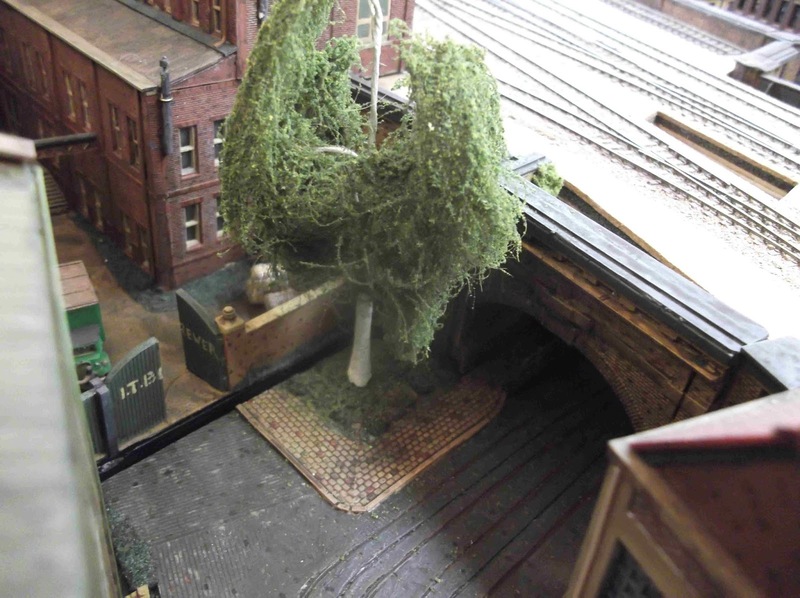 The first tree made its appearance on the layout. and some window cleaners hard at work (though one does seem to be very slow emptying his bucket). There were a few expressions of interest from Exhibition Managers, so perhaps the layout will be appearing in public again sometime soon. We were all exhausted at the end of the two days, but pleased with a successful performance as very little time had been spent operating before the Exhibition, and we were all "learning on the job". Final Practice before the Exhibition. First some new content on display. Keith's new traverser, with five loco standings and two access roads on the right, and four roads for trains on the left. 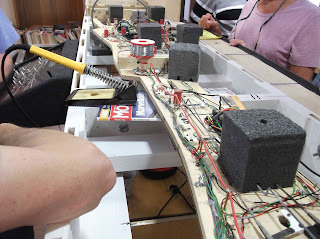 The right hand side is fixed, the left is moveable, with a lever-operated bolt system to ensure the moving part aligns correctly with the static part. A view from the end, showing the unfinished area on the right. 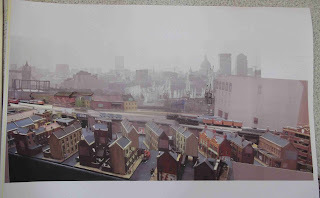 Most will be short roads under the virtual extension of the warehouse/goods shed in the background, whilst the right hand road is currently proposed for some form of runround loop for trains exiting and re-entering the layout. A couple of new buildings from David Smith, water tower (complete with lid/roof to keep the water free from impurities) and a platform which will probably provide the water crane(s) and coaling facilities. 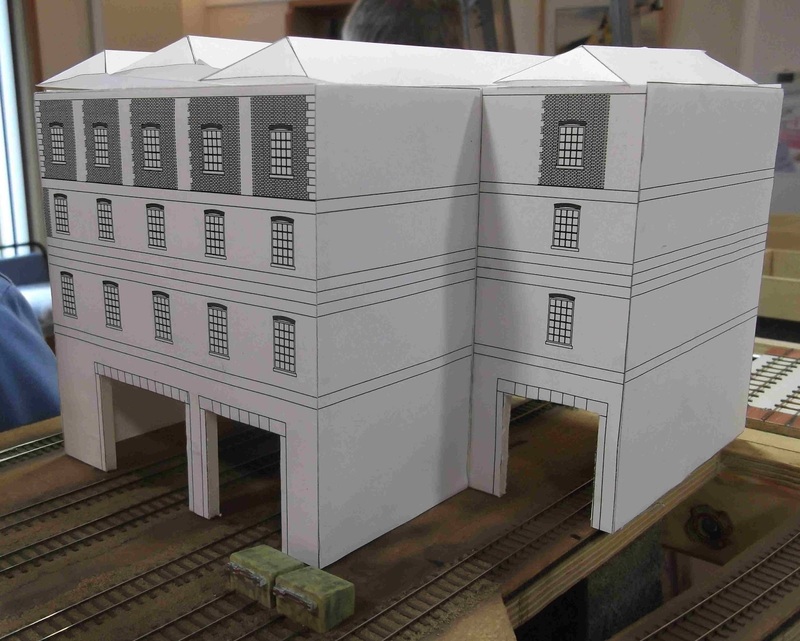 Mock up by Alan Smith for the goods shed/warehouse. There's still some discussion about height of the entrance arches, position of the right side wall, number of windows, position of the lift shaft, before the final version is produced. 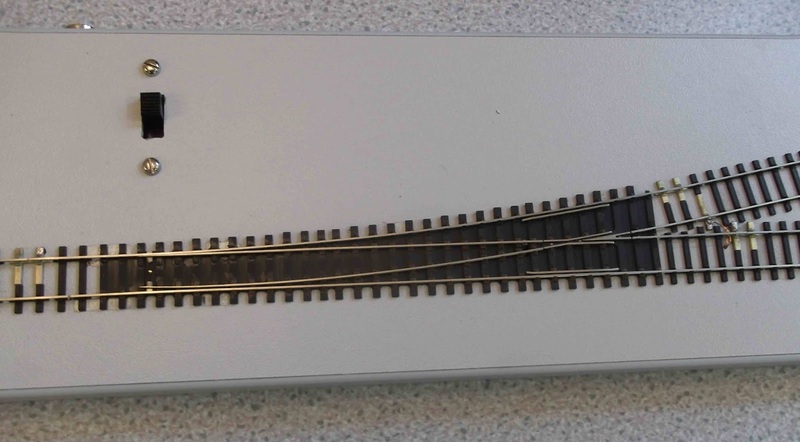 Also for Alan Smith, though not strictly for the layout - a small demonstration board showing the latest style of Easitrac turnout with (almost) no soldering. 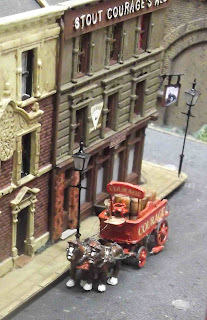 More from the Association Shops to ease the entrance to 2FS - a Farish Jinty converted using the latest kit, and one of the battery powered controllers. 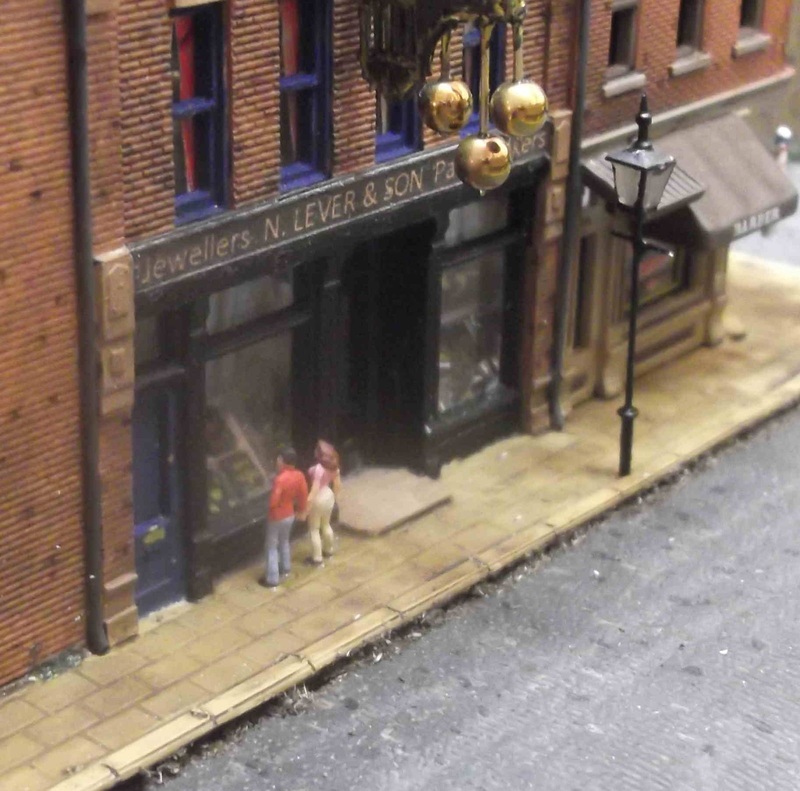 After a trip to the AGM at Bournmoor they will probably appear at next month's Exhibition to lure in new members. 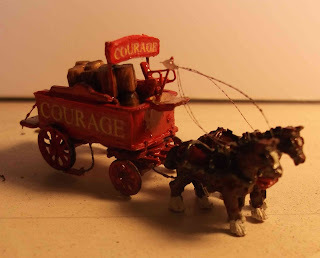 My own modest contribution - a horse-drawn dray to deliver beer to the Courage pub, whose cellar door is currently open. 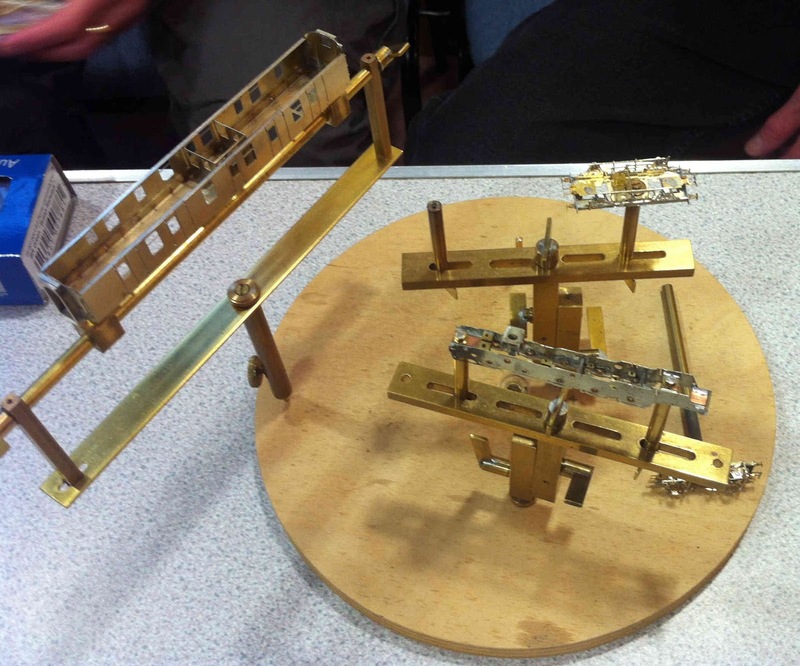 A Langley whitemetal kit, with extra detailing. But what about the promised practice session, you may ask. It developed into an extended bug-finding and -fixing session. Firstly, when the traverser board was connected an intermittent short was encountered. Re-testing confirmed Keith's earlier tests, that there was no fault in the traverser. But disconnecting the traverser removed the short, and reconnecting it restored the short. 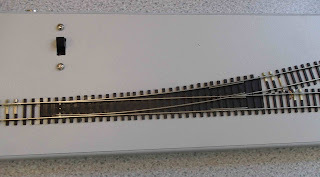 Eventually it was established that one of the turnouts was not correctly switching polarity of rails, and the traverser was connecting that rail to another rail of sometimes incompatible polarity, hence a short. There was a similar fault at the other end of the layout - faulty polarity switching at a turnout causing intermittent shorts. Two dead spots were located during extensive testing. All were finally fixed, leaving about half an hour for running. Pete King's multitasking abilities were tested by assigning him as signalman and driver of two trains (with a single controller), and he succeeded (most of the time). 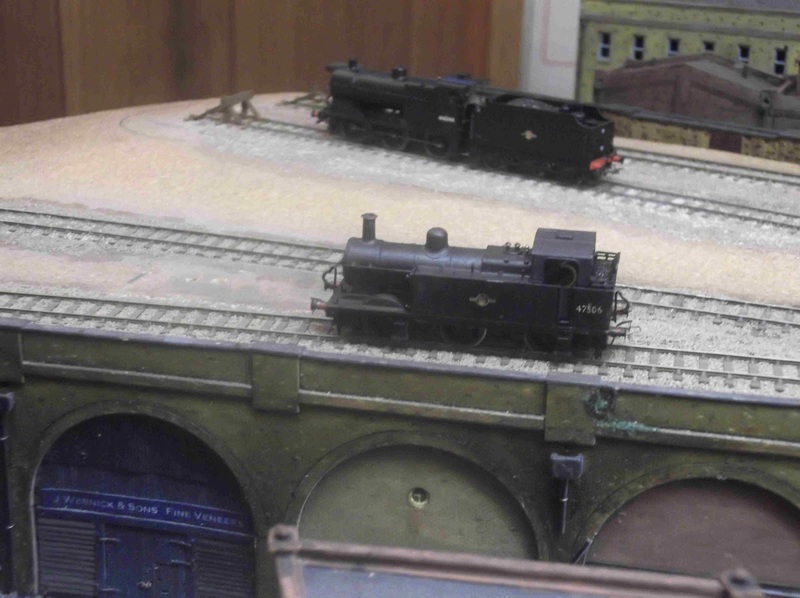 Half a dozen vans were added, a couple of brake vans, some shunted ensued. Lightning reflexes caught those items propelled off the end of sidings before they hit the floor, confirming the requirement for a few more stop blocks. The draft information sheets were discussed, and strong disclaimers were added that it's only a work-in-progress. If you want to come and see for yourself - Wilmington Church (to be pedantic, the meeting room behind the Church) DA2 7EG, 10th and 11th October, 10am to 5pm. Entry £4, for charity. 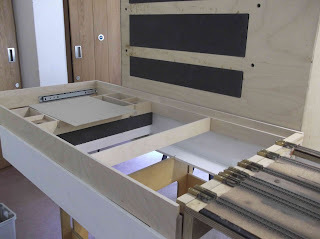 Keith had prepared a new baseboard frame to support a traverser/fiddleyard for one end of the baseboard. Current plans are to devote half of it to a traverser, to hold traffic to/from the outside world, with the other half tentatively allocated to an extension of the yard sidings. The trackbed spent much of the session inverted for repeated troubleshooting sessions, testing having revealed a dead section. After fixing that, the layout exhibited a permanent short circuit, for no apparent reason. 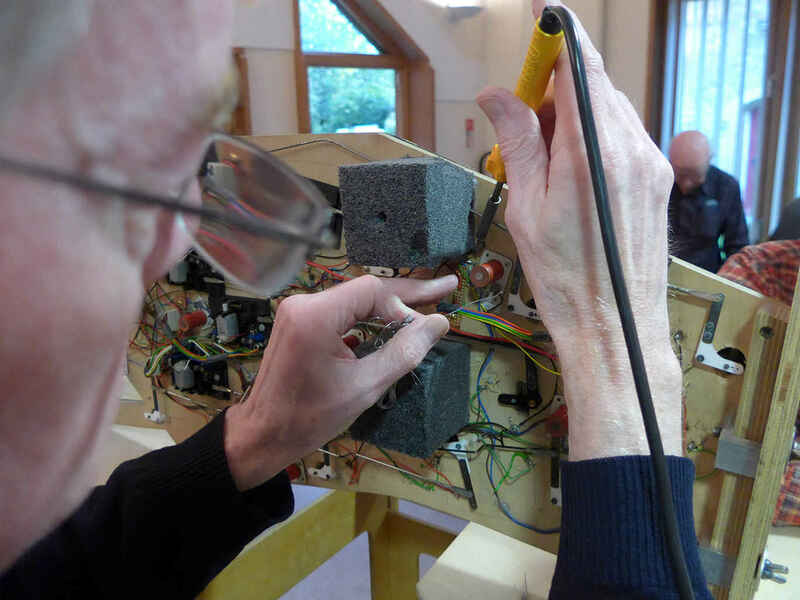 Time ran out before the last-identified fault was fixed, so the board was taken away for remedial treatment. 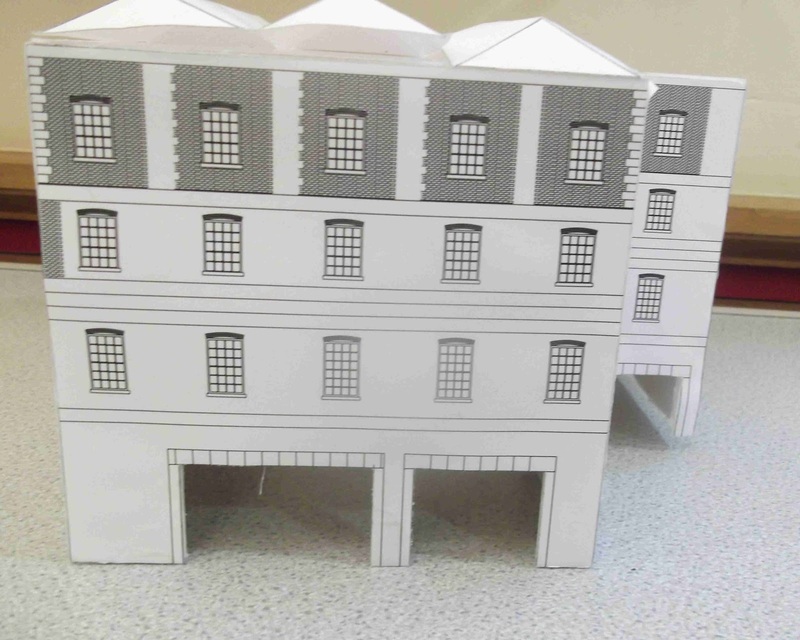 Various building mock-ups were discussed, and approved, and the finished versions are eagerly awaited. 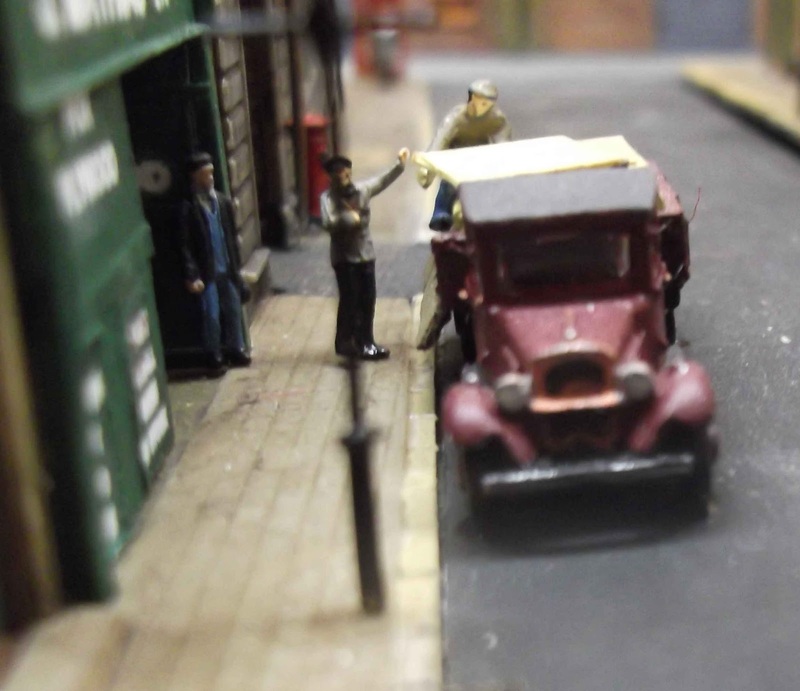 Most of the meeting was spent planning for the forthcoming exhibition appearance in October - attempting to prioritise work so the most essential changes are completed by the end of the August meeting, leaving the September meeting for an extended running session to try and find/fix bugs. 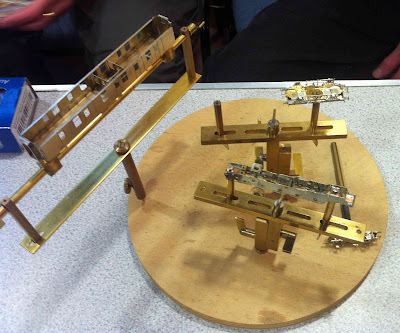 Keith will be building a traverser (or some other mechanism to hold the off-scene rolling stock). Alan will be replacing the existing lighting system (which runs far too hot) with an LED strip, and adding a temporary 6-inch curtain below it, to ensure the layout is viewed at a suitable angle. The backscene was discussed inconclusively (there seems to be some incompatibility between proposed height of backscene and actual height of operators...). 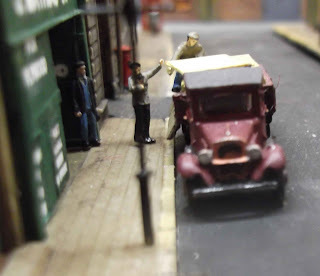 A slightly implausible visitor - Alan's just-out-of-the-box Dapol Merchant Navy, which ran immaculately until its N wheels encountered the 2FS turnout. Conversion to a West Country is threatened. David's not-quite-finished WD 2-8-0, from a Foxhunter kit. 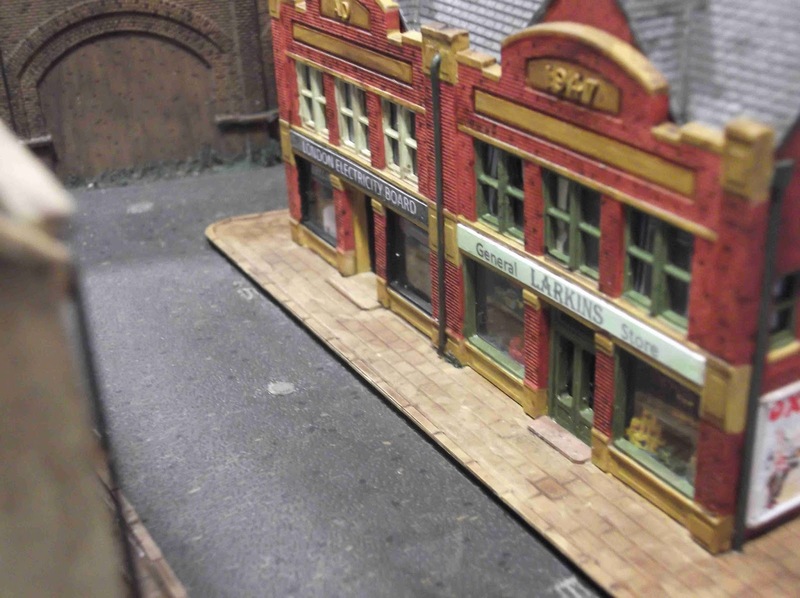 A lovely scratch-built model by David, but rather too modern for the 1960s period which Lighterman's Yard is supposed to depict. Subsequent running of a Jinty (not pictured) revealed apparent short circuits in certain turnout positions, provisionally diagnosed as poor insulation on some of the wires. Another job for next month's meeting. Pete Townsend brought in the full set of buildings, which now completely fill the front of the layout. vehicles. Street lights are under construction, additional bicycles and motor vehicles are awaited, with the suitability of horse-drawn vehicles still being discussed. There were complaints of "Too much greenery" for the lawns in front of the LCC buildings, but weathering should produce a more subdued shade (brown?). 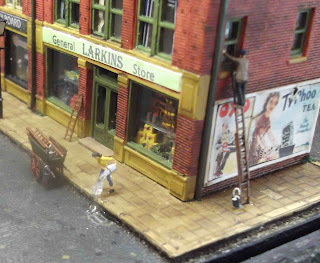 The pawnbroker's sign appears surprisingly untouched by London's dirt and grime. 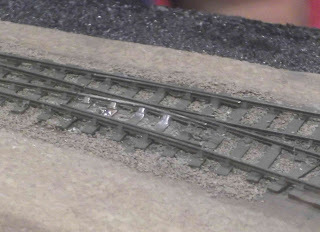 Just visible at the top right corner of the picture is part of the latest bridge to be added to the layout - not yet glued into position. Richard provided me with a CD of photos from earlier meetings, some of which will be appearing in future blog entries. 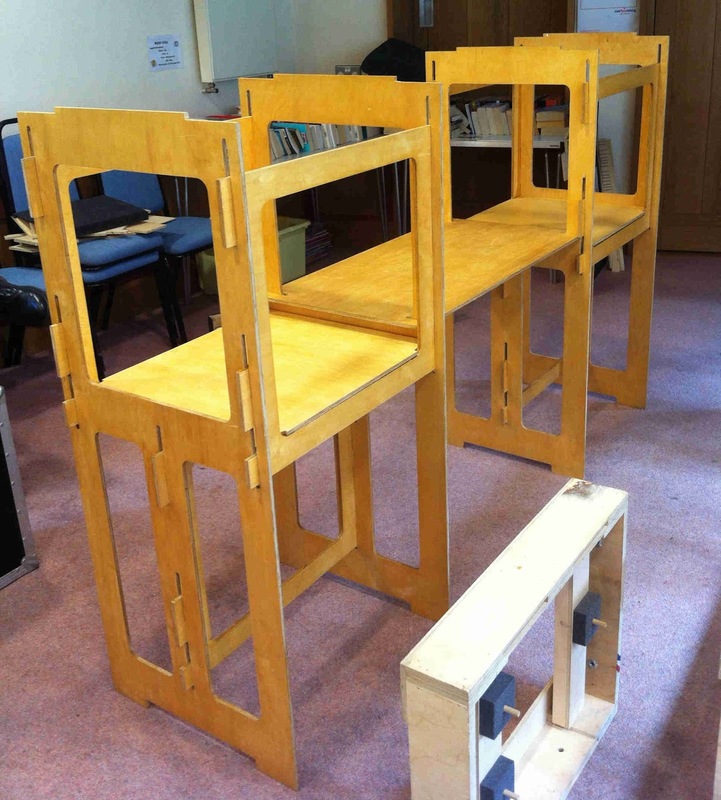 As a taster, here's the first stage of assembling the layout - the legs have been slotted together, and the first section of baseboard is about to be placed on top. 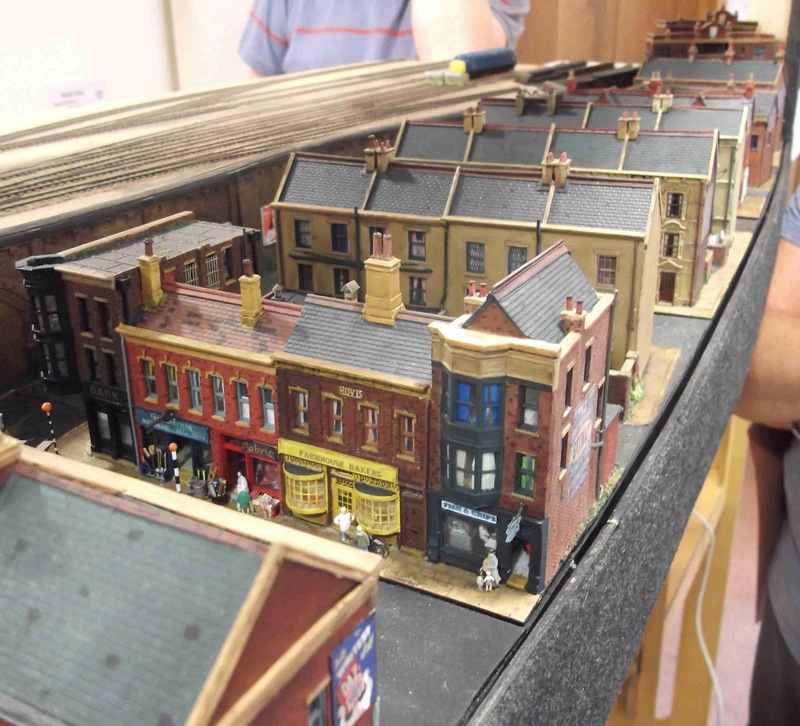 The Group meets, generally on the second Sunday of each month, to work on the layout Lighterman's Yard. This is a slow process - as the layout needs to be extracted from storage and assembled at the beginning of each session, then disassembled and put back at the end. It started about twenty years ago, under the guidance of Andrew Cox. 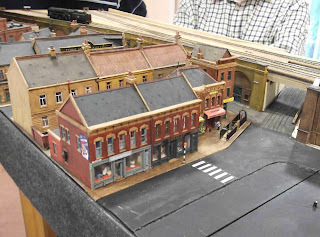 Recent progress has been good, and the layout made a semi-public appearance at last year's Kidderminster 2mm Meeting. 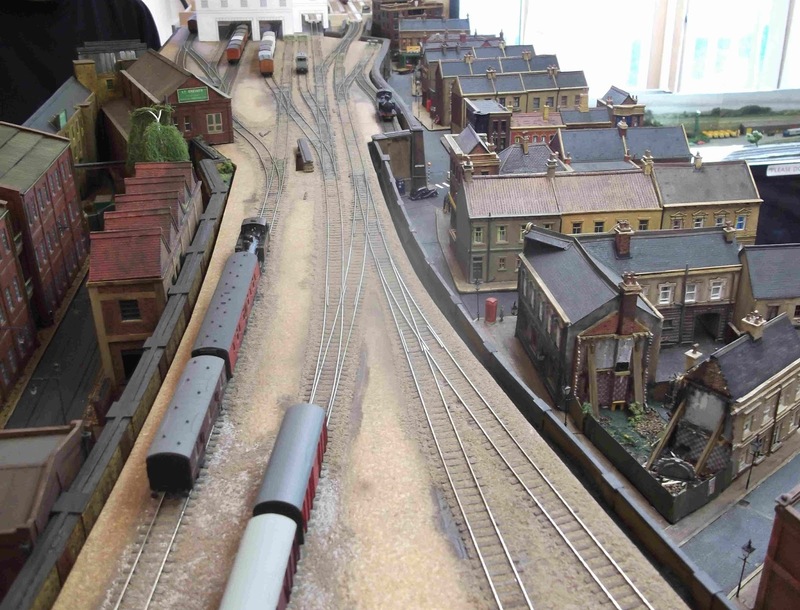 There's an invitation to appear in the 2015 Wilmington Charity Railway Exhibition - which would be rather convenient, as it's held virtually next door in the Church Hall, and Lighterman's Yard could be set up in its usual location (the Church Meeting Room) as a separate annex to the main show. PW work straightened a few bent rail ends. Two of the front scenic baseboards were fitted with more secure attachments, to stop them sliding around. Two more viaduct walls were glued in place. 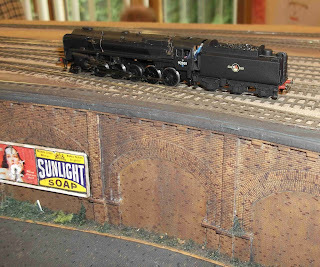 During an extended testing session, the trackwork performed almost faultlessly, whilst a 9F demonstrated immaculate slow running (and slightly less than immaculate steering through some of the turnouts). The base for the traverser was studied, with discussion of how best to provide space for loco run-round as well as train storage. Plans for some of the missing buildings were discussed. 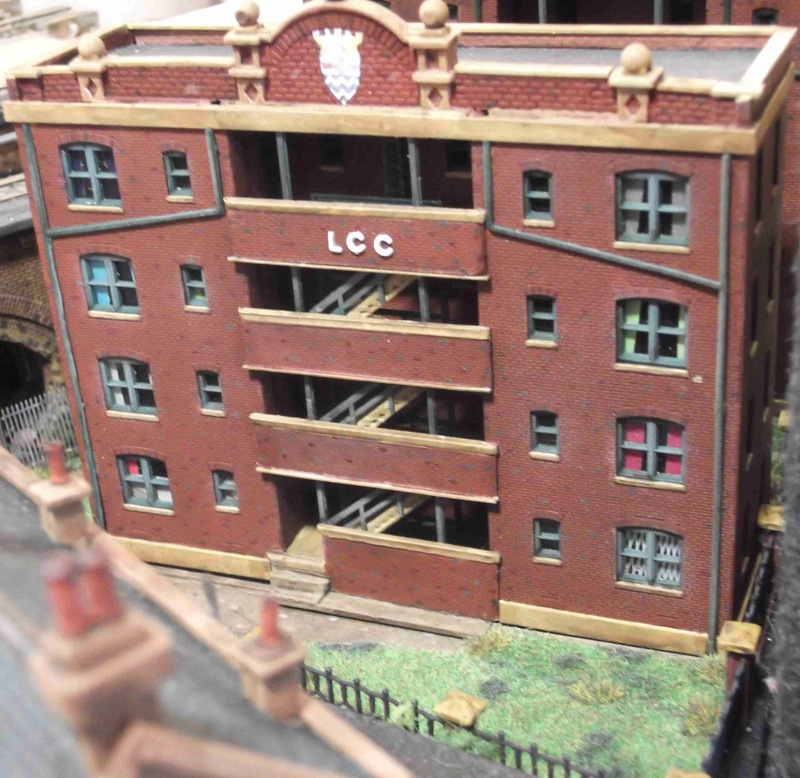 Some of the buildings at the front of the layout. Each group of buildings is built on its own thin base, which fits into a corresponding hole on the main baseboard. Thus individual groups of buildings can be taken away from the main layout for further work. 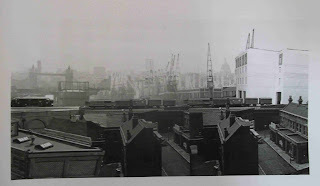 Location seems to be "somewhere in South East London", and period probably in the 1960s, around the end of steam on the railways. 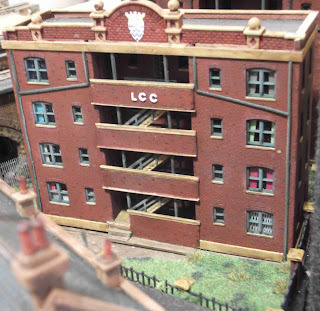 Having originally been built for DC operation, it has now been converted to DCC. 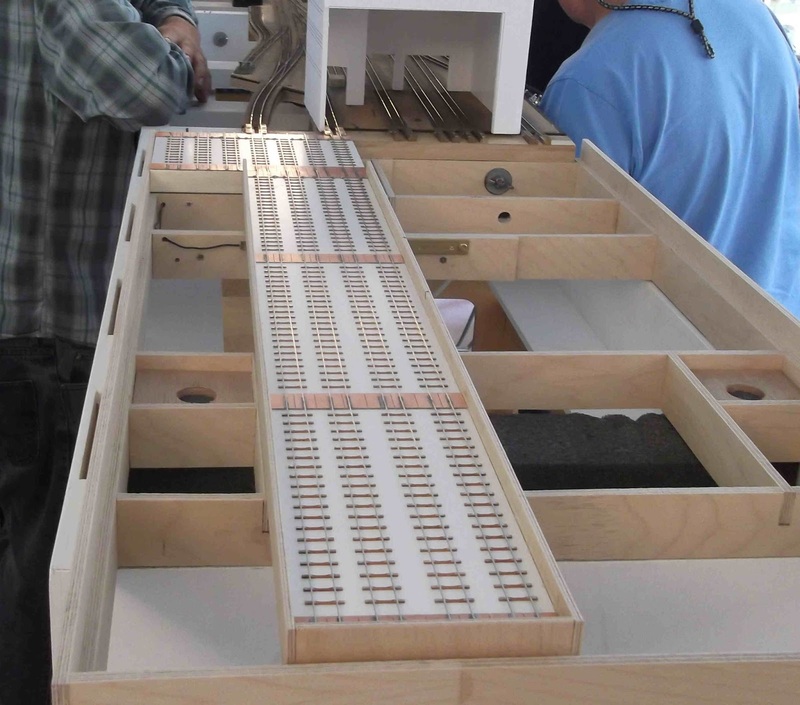 Turnouts, including a double slip, are all electrically operated from the central control panel. 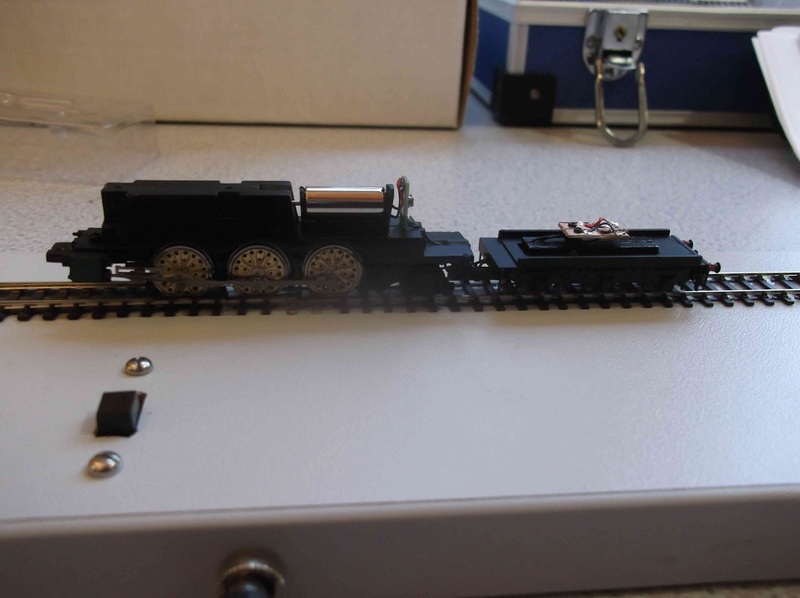 As a shunting layout, no signals have been deemed necessary yet, but probably one or two will be added eventually. Extended testing of the trackwork, using a 9F. 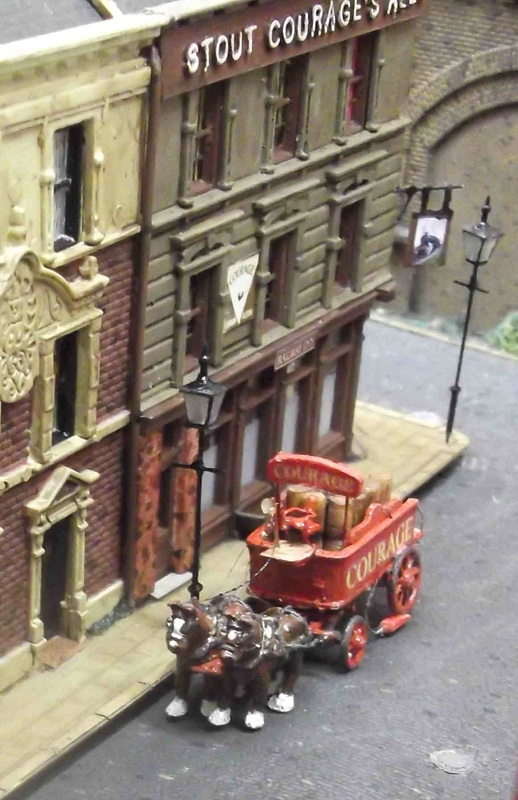 It struggled round some of the curves, so using it as a shunter doesn't seem like a good idea. 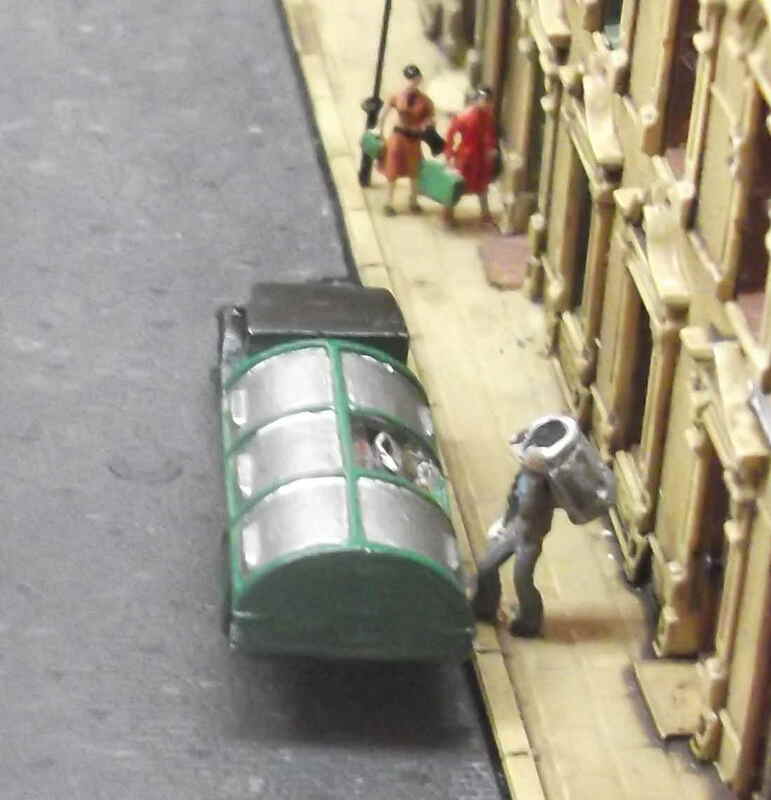 Its stated haulage capacity was seventy four wagons, but there were no wagons available to demonstrate this (and such a train would be far too long to fit on the layout). A bit more testing of the trackwork - this time a RTR diesel with drop-in wheels. One or two minor hiccups, suggesting that btb tolerances need checking on one axle and one turnout.